This was the first time I tried this activity, and I was really happy with how well it worked in the classroom. Students were engaged and worked as a team to complete each challenge. Due to time, most groups did not complete all 6 of the tasks, but that wasn’t my goal. Collaboration, Communication, and Perseverance were my objectives. This was the first time I used this activity and it lead to a nice discussion about learning new things, being challenged, and persevering and how somethings seem really hard at first, but then once you master it, it becomes easier. I am in the process of collecting the Instagrams that the kids drew and they came out great! I will post some examples next week. This was an updated version of an activity that I have done each year, and it was much more engaging for the students, they enjoyed the challenge of finding the broken rules. This also reinforced their reading comprehension, being able to use clues from the text, evaluating text, summarizing the safety rules into 2-3 words only, to name a few. Tangram Challenge – How can we fit in the extra piece? SpongeBob Safety Scenarios – finding the safety violations, identifying the rules, and summarizing them into 2-3 words – can you find all of them? 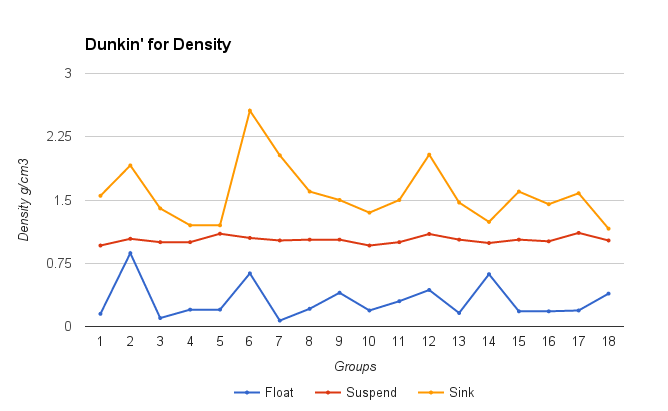 Dunkin’ for Density – finding the mass after the dunk tank. This is a wonderful problem solving and hands-on activity to use as part of your density unit. The students enjoy the challenge and have a solid understanding of density after completing this activity. Even though students quickly figure out how to make the canister float and sink, making the canister suspend is pretty challenging and requires a lot of trial and error and problem solving. To qualify as suspending, the film canister needs to float just under the surface of the water, with a small portion of the top just breaking through. How I also verify that it is suspending is by pushing the film canister to the bottom of the tank, if it comes up very slowly to the surface, it counts – if it comes up quickly or stays towards the bottom, it doesn’t count. Students then need to figure out that if it comes up too quickly, they need to add to the mass, if it comes up too slowly, they need to remove some of the mass. It will take several tries to get it just right. Towels – the more the better! Introduce the Dunkin’ for Density Challenge – their goal is to make the film canister float, suspend, and sink by placing contents inside of the film canister. Explain the procedures, review how to use the TBB, note that the film canister must seal completely and be air tight so that water doesn’t enter, and also demonstrate how to use the dunk tank properly and to dry off the canister before finding the mass. Do not give the students the value for the volume of the film canisters until they have collected their data. If the students know the volume of the film canister, they may figure out the mass needed to make the film canister’s density close to 1.0 g/cm3. The value is approximately 39 mL or 39 g/cm3 – verify with a large graduated cylinder that the film canister can fit inside of – or use an overflow can to find the volume (link). I will give the volume to each set of lab partners individually and ask that they don’t share that information with the class. Once students have calculated the density, collect class data on a spreadsheet projected on the board/screen. Discuss results – why did the film canister float, suspend, or sink in the tank of water? What relationships did you notice? Results show that densities close to 1.0 g/cm3 suspended. This is one of the team building exercises I plan to use with my 6th graders during the first week of school. Many variations of this lesson can be found online. For this version, I created 6 different challenges for the students to tackle – each one increasing in difficulty. Not every group will get to complete all 6 challenges, and that is OK. The objective is to learn to work together as a team and not give up. July 26, 2017 – One recommendation I have for this activity is placing the cups on the floor, when the cups fall off the table it makes it more difficult to complete the task in a timely manner. Trying to pick up a cup that fell over. Almost done with Challenge #4! Which challenge was the easiest for you group to complete? The most difficult? Why? Did your techniques change as you advanced to each challenge? Explain why or why not. Describe a technique that worked best within your group. Compare using two hands vs. one hand when holding the string to guide the cups. List advantages and disadvantages for each. Compare using verbal and nonverbal communication, what were some of the challenges your group faced? If you were to complete this activity again, what would your group do differently? What would you do the same? Why are collaboration and communication skills important characteristics for scientists to have? Did you feel like giving up at any point? How did you and your group deal with frustration?